Relatively frost hardy and heat tolerant. Varieties available to spread harvest from February to May. Requires cross-variety pollination for maximum crops. Feijoas enjoy warm summers (which we do have in N.Z. from time to time) and cool winters. They accommodate well to a wide range of climatic conditions and established trees will withstand quite extreme heat. However, extended periods of hot, dry weather around November-December may affect fruit set and final yield. The trees are hardy down to -10°C but the fruit may be damaged with a -3°C or heavier frost in autumn. This shouldn't present any problems with early fruiting varieties but may be a consideration when growing later fruiting varieties in cooler districts. Winter chilling is essential to promote flower bud initiation and 100 to 200 hours at around 7°C is considered ideal to maximise croping potential. This should be easily achieved in most parts of N.Z. Wind damage to both the fruit and the tree structure is possible in exposed sites, especially when the branches are loaded with mature fruit so the provision of shelter is regarded as essential for commercial feijoa plantings. Planting live shelter to filter the prevaling winds will also assist in reducing moisture loss through transpiration as well as creating a nesting habitat for the birds that are essential for feijoa pollination. Feijoas can be grown in semi-shaded situations but an open, sunny site suits them best. Generally the warmer the site, the earlier the flowering and harvesting. It is possible to grow feijoas without any supplementary watering. In most areas of N.Z. however, managed irrigation is a must to ensure maximum fruit size and quality in dry years. The most critical times to ensure adequate moisture levels are: Initial planting to minimise transplant shock, at flowering time in early summer, mid to late summer when the fruit is starting to swell and then post-harvest to assist in tree recovery. Be aware, though, that feijoas hate to have their roots sitting in water-logged soil for extended periods. Feijoas have highly efficient, fibrous root systems and will survive in almost any soil but the ideal is a fertile, heavy, free-draining soil with the ability to retain moisture through dry periods. Heavy clays that remain water-logged for extended periods are generally unsuitable for commercial production and very light, sandy soils may promote vegetative growth to the detriment of fruit set and final yield. As mentioned above, soils prone to excessive water-logging can cause problems even though feijoas are more tolerant of 'wet feet' than most other fruiting plants. Excessively wet sites may require contouring to create raised beds and/or artificial drainage such as pipe or mole drains. More expense! Feijoas prefer slightly acid soils with a pH of 6.0-6.5. High pH, alkaline conditions can cause stunted growth and leaf yellowing. An initial soil test is essential not only to identify the soil pH but also to indicate if nutrient levels need adjusting prior to planting. Annual soil and/or leaf analysis in winter will determine if adjustments to the soil pH or nutrient levels are required. Feijoas are usually planted in single rows 4.5m to 5m apart and with 3m to 3.5m between plants in the row. This allows the trees to form a continuous canopy along the row after 4-6 years. At these spacings and taking into account machinery headlands the plant population is approximately 500 to 600 trees per hectare. Do you want an extended harvest over 3-4 months or would you prefer to reduce picking to a few intensive weeks? Varieties are classified as early , mid-season and late maturing. Are you situated in a warm Northern location that will allow early ripening or a cooler Southern district where harvests are later and autumn frosts may preclude the planting of late-fruiting varieties? 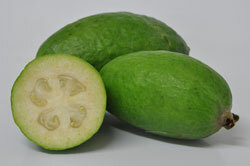 Where possible seek advice from an established feijoa grower in your area. Cross-pollination between two or more compatible cultivars is essential to ensure maximum crops for almost all varieties. See our individual varieties for more information. Autumn/early winter planting March-June is fine in the warmer areas of N.Z or spring September-October in cooler districts. Root growth commences when the soil temperature reaches 8-10°C. Incorporate any nutrients required to achieve a suitable pH and a good base level of fertility as indicated by your soil test. Approximately 150grams of Blood and Bone per plant thoroughly mixed into the soil at planting time is the recommended way to give young feijoas a safe, slow-release boost as they become established. Thorough irrigation is recommended at planting time to settle the young plants into position and to minimise transplant shock. Disturb the root-ball as little as possible and plant the young trees at approximately the same depth as they are in their containers with just a light covering of soil over the roots. Staking is usually not necessary but may have to be considered in extremely exposed situations where wind-wrenching might prohibit new root development.Tharfield feijoas are trained to provided you with well-shaped plants that will require little, or no pruning at planting time. Given a good base level of soil fertility feijoas require relatively light applications of supplementary fertiliser for the first couple of years but, once they commence significant fruiting at year three, the demand for nutrients can start to increase dramatically and may continue to do so as the trees grow and yields increase. Annual soil and leaf testing are used, along with orchard appearance, performance records and information regarding previous applications, to establish a suitable fertiliser regime to replace the nutrients extracted by the crop. Root growth starts when soil temperatures reach 8-10°C so it is usual to apply approximately two-thirds of the nutrients in August/September to take full advantage of Spring growth. The remaining third is applied post-harvest in autumn to assist tree recovery. This application should be low in nitrogen to minimise the growth of soft, potentially frost-prone vegetative growth. It is possible to grow feijoas without any supplementary watering. In most areas of N.Z. however, managed irrigation is a must to maximise fruit size and quality. The most critical times to ensure adequate moisture levels are: Initial planting to minimise transplant shock, at flowering time in early summer, later when the fruit is starting to swell and then post-harvest to assist in tree recovery. Be aware, though, that feijoas hate to have their roots sitting in water-logged soil for extended periods. 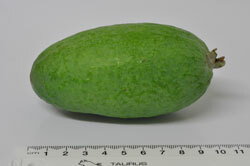 Whilst feijoas are regarded as being reasonably resistant to many major pests and diseases there are several types of sucking and chewing insects that can damage both foliage and, more importantly, the fruit. Insect pests are rarely a problem during the first two or three years before cropping starts in earnest but young plants should be regularly monitored for signs of damage. The main insect pests that may affect feijoas are scale insects(Greedy scale and Chinese wax scale), caterpillars (loopers and leaf-rollers), bronze beetle, mites, mealy bug, thrip and the feijoa bud mite that can cause foliage distortions in spring. The Australian guava moth, which attacks many fruits including feijoa, was discovered in the far North in 1997 and must now be added to the potential pest list in warmer districts. Good orchard hygiene can do much to minimise the risks but the efficient control of insect pests is particularly crucial where markets demand completely blemish-free fruit. Whether or not to apply chemical control is a decision for the individual grower to make but here at Tharfield we use an I.P.M Services (2009) Ltd integrated pest management program that requires us to regularly monitor our crops, to maintain high standards of nursery hygiene and, where appropriate, to make efficient use of predator insects in order to minimise the need for chemical controls. Fortunately, feijoas are free of any major fungal problems and are rarely troubled by soil-borne diseases. Leaf molds and spotting may occur but this is usually easily controlled with applications of copper sprays in winter. Young feijoas struggle to compete with weeds and grasses, so efficient weed control around the trees is crucial to promote maximum growth. Because the feijoa's fibrous root system is easily damaged by hoeing or tilling, the careful application of suitable residual herbicides is favoured by many growers along with regular mowing of the grass swathes between the rows. Feijoa growers are generally more concerned with attracting pollinating bird species such as blackbirds and mynahs than having to control avian pests. Pukeko, however, can cause damage to low-hanging fruit so pruning to raise the lowest branches to around 60cm from ground level may be wise where pukekos are a potential problem. To maximise yields, frequent visits by larger birds such as blackbirds and mynahs are essential to spread pollen throughout the orchard and to ensure the cross-pollination of compatible varieties. As these birds feast on the flower petals they collect pollen on their heads and carry it from tree to tree. Small birds such as waxeyes and insects including bees have little effect and, indeed, may actually reduce the chances of successful pollination as they compete for pollen but rarely come into contact with the stigma. There is still some debate on the selection of the best varieties to achieve maximum results but there is no doubt that most feijoas need cross-pollination with another cultivar if they are to achieve worthwhile commercial crops. Experience, however allows us to make some considered recommendations (see individual varieties for more information). To facilitate successful cross-pollination, blocks are usually planted with two or more compatible cultivars in alternating rows to ensure that the birds carry pollen between the varieties. Feijoas fall to the ground when mature and this can inflict skin blemishes and bruising which ultimately causes reduced shelf-life and generally inferior quality fruit for the consumer. Commercial growers need to anticipate this drop and remove the fruit from the tree by regularly (sometimes even daily) 'touch-picking' by hand. This operation is highly labour-intensive as it involves gently tugging mature-looking fruits to test if they are ready to fall and requires some training and experience to recognise the mature fruit. Every effort must be made to avoid skin damage, prevent interal bruising and minimise rubbing on the natural wax bloom that is a feature of some varieties. Care is required throughout the harvesting, transportation, grading and packing operations. Some growers prefer to grade fruit after over-night cool storage as this treatment can reveal previously undetected skin blemishes. So many factors can influence yields from commercial feijoa orchards that we can only give a very general indication of possible yields. In the third year from planting the yield could be approximately 5 tonnes/hectare from the young trees rising to around 25 tonnes/hectare in year seven or eight. Check out our varieties for details of fruit size and expected levels of fruit set for individual cultivars. 'Feijoas, Origins, Cultivation and Uses' - Grant Thorpe & Rod Bieleski.